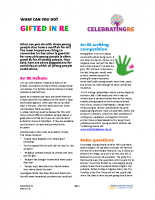 What can you do with those young people that have a real flair for RE? The most important thing to remember is that what is good RE for very able young people is often good RE for all young people. That said, here are some suggestions for activities at which all young people could shine.